Open house Monday/May 28 @ 10 am to noon.If great schools are what you are looking for then you have found it with this beautiful home! Timerlin Creek Elementary is ranked #2 in the #1 school district in FL. St. Johns County is 1 of the top ranked school districts in the entire nation! Timberlin Creek is also ranked #8 out of 2,093 elementary schools in FL. Your children will get the very best education possible living here AND your property values will increase each year. The backyard is spacious enough for a nice sized pool PLUS the amenity center's pool is within easy walking distance. This light filled 5 BR/3 BA home is complete with plantation shutters & a wide open floor plan,ideal for cooking in your large gourmet kitchen while entertaining your guests in the adjoining family room.Kitchen includes brand new granite countertops and subway tile backsplash, 42 inch cabinets, and all stainless steel appliances, under the counter lighting, can lights, large island, breakfast nook, & brand new dishwasher, sink, & faucet. Pet free from the time it was first built. The 2 ACs are only 2.5 & 3.5 years old.The master bedroom has 2 large walk in closets. When you walk outside all you see is a beautiful nature/conservation preserve on 2 sides, with no chance of homes being built there. In the mornings & evenings you will enjoy hearing the birds singing and watching the wildlife appear on the edge of the wooded preserve. Other facts about this beautiful home! 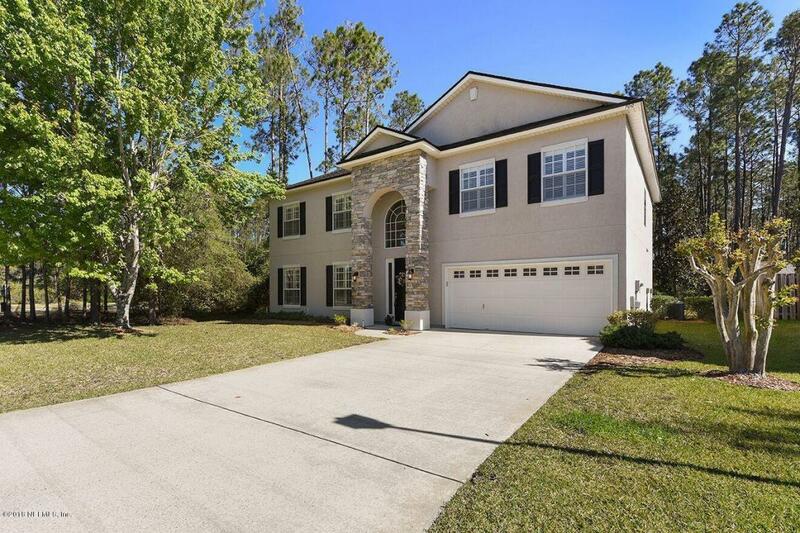 Located in St. Johns County School District with all A graded schools. On a cul-de-sac street with no through traffic and with great neighbors. The backyard is the perfect size for a pool and the home's 3rd bathroom would serve well as the pool bathroom. The large owner's bedroom upstairs has a tray ceiling, and the bathroom has a garden tub and separate shower. There are large closets and ample storage areas throughout the entire home. The many other upgrades include high quality crown moulding, plantation shutters, built in night lights in the bathrooms, new chandeliers, complete irrigation system, shadow box moulding in the dining room, plus 2 bonus/game rooms. You will be in easy walking distance of some of the best restaurants and grocery stores in the area. Your new home is also the closest in the whole community to the community center and the adult and children's swimming pools and clubhouse. Because this is an energy efficient home the monthly electric bills on this large home average only approximately $200/month.